Adjusting to Sweden’s food availability I noticed one thing: pumpkins are not very popular. Butternut squash is available year round, and I feel lucky because it’s my favourite type. But finding other kinds of squash and pumpkins is not so easy. There is one time when stores suddenly have them and that is around Halloween. Rather than for eating, they’re sold for lanterns. When Halloween is done, unsold pumpkins drop in price and that’s when I took a muscat squash home and made roasted pumpkin salad. Pumpkin and squash are easy creatures when it comes to cooking them. The oven is probably the best ally when preparing them. Things can go as easy as just slicing them in half and tossing them in the oven – that’s how you make spaghetti squash for example. With butternut squash there is always some more prepping involved as that one I normally peel and dice. 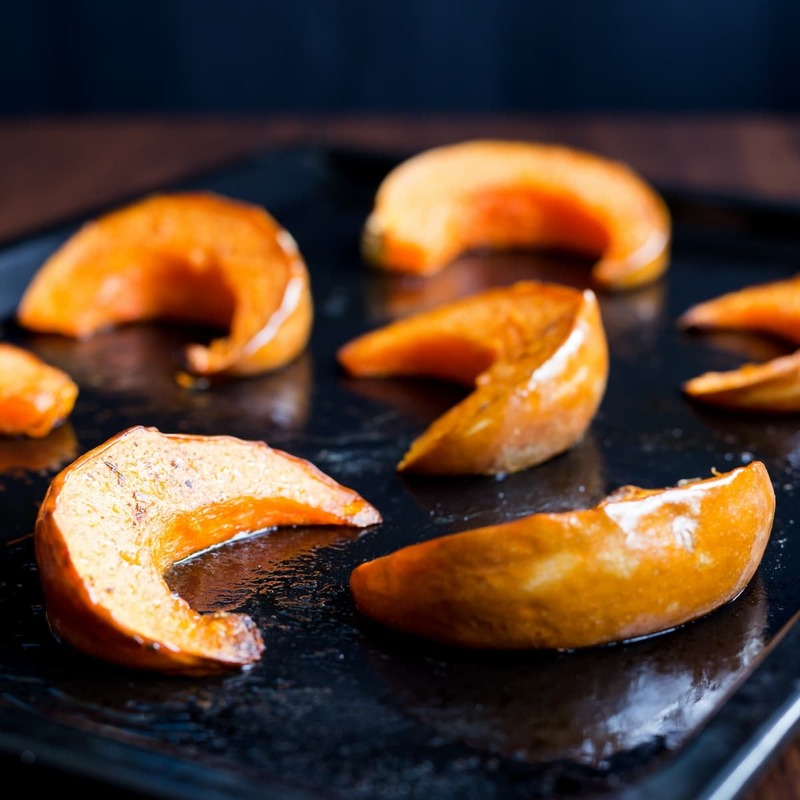 With round squash like muscat or the traditional “lantern” pumpkins you can skip the peeling altogether, and just slice them and throw them in the oven. That’s the foundation of this roasted pumpkin salad recipe. 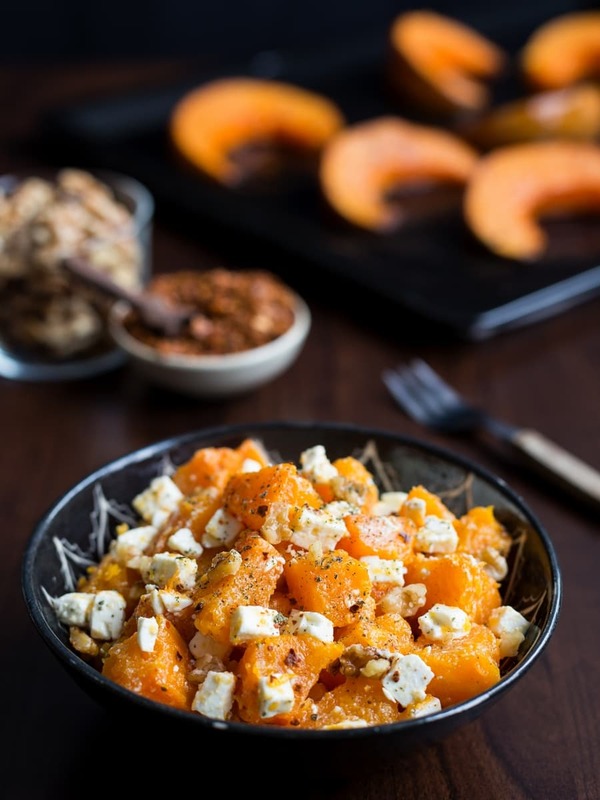 Oven-roasted pumpkin pieces, combined with feta and walnuts and seasoned with chilli oil and crushed dried sage leaves. First of all, wash the pumpkin as you will be roasting it unpeeled. Cut it in half and save the other half for later. Remove the seeds and soft pulp around them and cut the pumpkin into 5-6 slices. Pour some olive oil onto the bottom of an oven tray and spread it around in order to coat it all. In a small bowl add 3 tbsp of olive oil, 2 dried sage leaves finely crushed, the rosemary leaves finely minced and the sweet paprika. Stir to combine and spread over the pulp of every pumpkin slice. Lay the slices on the tray over one side, not on the skin, just make sure that both sides are nicely coated in oil mixture. Bake the pumpkin slices for a total of 45 minutes at 180°C, turning them after the first half hour so that both sides get to nicely roast. When the baking time is up, take out the tray and let the pumpkin cool down to room temperature. With the help of a knife gently peel the pumpkin slices. It should be a fairly easy procedure, as it should pull away from the pulp very easily. Dice the roasted pumpkin and transfer to a serving bowl. In a smaller bowl combine 1 tbsp of olive oil, the chili flakes and 1 dried sage leaf finely crushed. 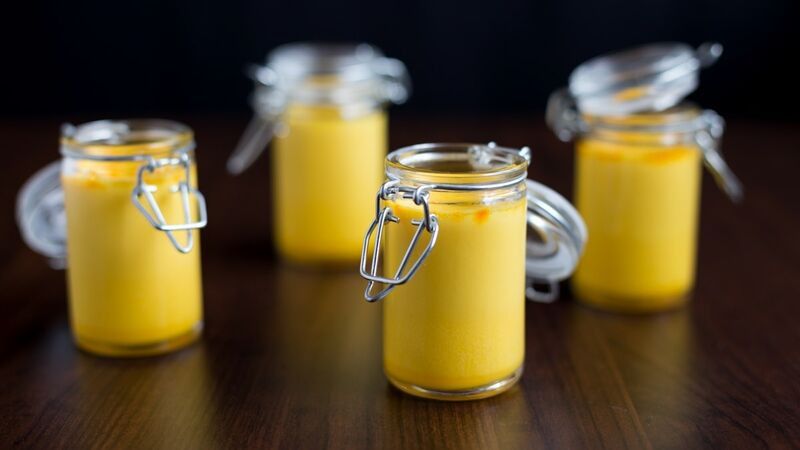 Stir and pour this dressing mixture over the pumpkin pieces. Add some salt and toss. Depending on the type of squash used, this salad may come out quite sweet, so the quantity of salt may vary. Keep in mind that the feta will help balance the overall taste, but I like to season the pumpkin alone with some salt to bring it to a more neutral taste. Cut the feta into a small dice or crumble it, and add it to the bowl. Lastly, add the chopped walnuts. You can optionally toast them, or just use them directly. Gently toss to distribute the other ingredients all around and serve. Some recipes call for the use of honey. I preferred not to use that. Again, it all depends on individual taste, but my pumpkin was already quite sweet alone. I can see honey fit very well in a roasted butternut squash salad, as that type of squash is less on the sweet side than muscat squash. What to do with the other half of the pumpkin? Well of course if feeding a large party, you may as well double up all the quantities from the start and make a large bowl of this salad. I decided to slice it and roast it, and then save it for later in the freezer. Since I don’t know if I’ll be making risotto or pie (like this squash pie I made for Thanksgiving) out of it, I preferred not to add any spices and I just coated it in olive oil. Either diced or mashed, roasted pumpkin will stay in the freezer until the inspiration for my next pumpkin dish comes. I am particularly proud of the pictures in this post, mostly for the beautiful bowls I used. They are from Studio Kurbits. Not only is the potter behind this project a very talented artist, but I am lucky to also call her a dear friend. Soon she is going to teach me how to make my own plates, so do expect food styled on my own ceramics! (OMG! If they turn out decent enough to appear here, ça va sans dire.) Having access to custom tableware is the dream of any food blogger, so I can call myself a very lucky one! 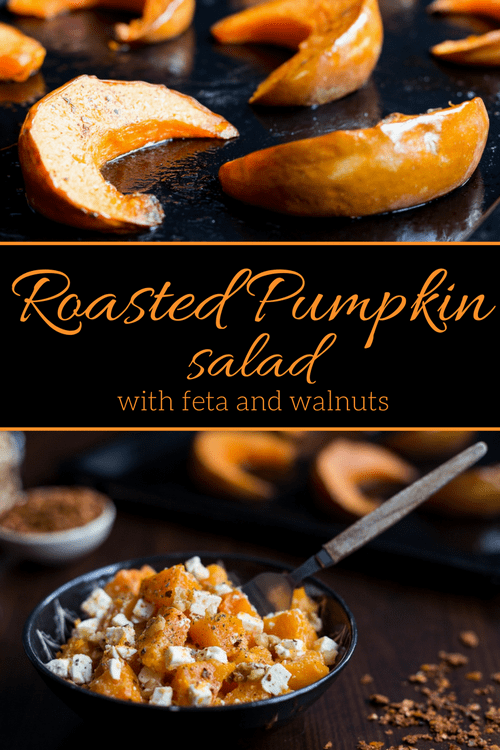 It never occurred to me to pair pumpkin with feta and this sounds excellent! Adding feta to the shopping list. 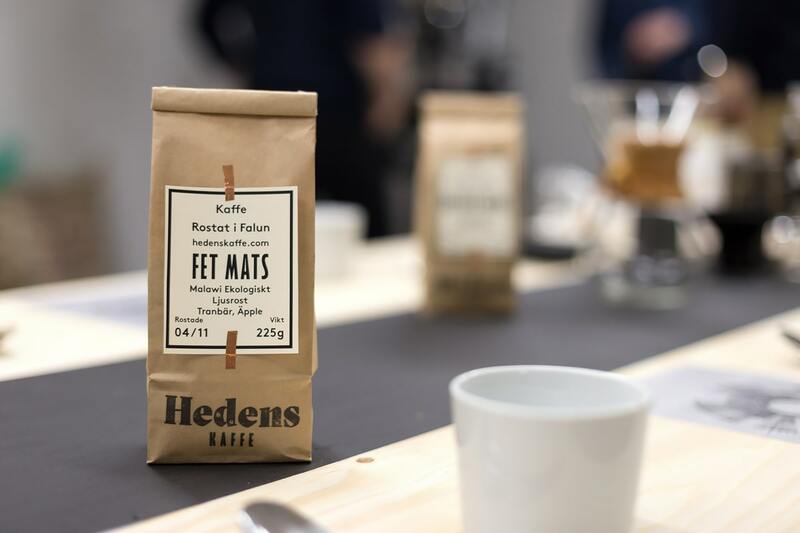 It’s a very nice pairing, and if walnuts are your thing don’t forget to add those, too!! Okay, YUM. This right here is why winter is my ultimate eating season. This looks so stinking good- cannot wait to try it out! 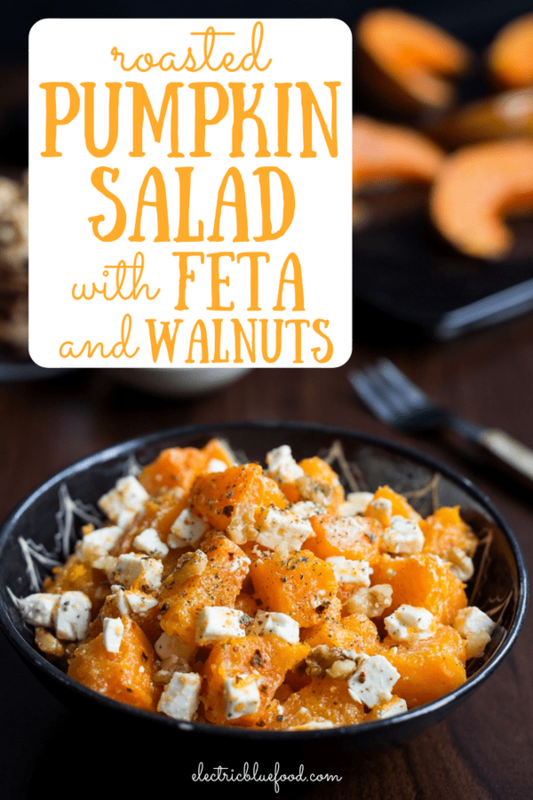 This is a magical combination of pumpkin, walnuts and feta1 so flavorful and so vibrant delicious colors! Pumpkin salad is one of my favourite uses of pumpkin! Those pumpkin slices look so flavourful! I know! I don’t normally include step by step photos but prefer to focus on the finished dish, but these pumpkin slices were so pretty I couldn’t not photograph them! Pumpkins are so versatile! Great in risotto or used to make gnocchi, too. They work wonders in savoury dishes as much as in pies! What a fabulous recipe for a fall salad. I don’t make enough salads in the fall and this has got to change. So many good flavors this time of year! I agree, so many wonderful flavours. Yet the days getting colder and colder make you crave for hot meals rather than salads. Still this can be a lovely side to a meat roast! I was just in San Antonio and Austin, Texas last week and all the grocery stores had squash and pumpkins. I grew up in Wisconsin and fall has always been my favorite season because who doesn’t love pumpkin dishes? I should have bought one and taken it to New Orleans with me because I’m totally craving this salad right now! I am not familiar with New Orleans but from your words I guess it’s too hot for pumpkins? I love pumpkins too and I’m glad to see that this year I’m finding them more in stores than I did last year, when they all only appeared around Halloween. Oh if they like pumpkin I’m sure they will appreciate it! Yum! Squash, feta and walnuts are a fantastic combination. How tasty this looks! Wow! I never heard or seen a pumpkin salad before! I am very curious as to what it tastes like! There is a nice contrast between the sweetness of the pumpkin and the tang of the feta. You should really try it! 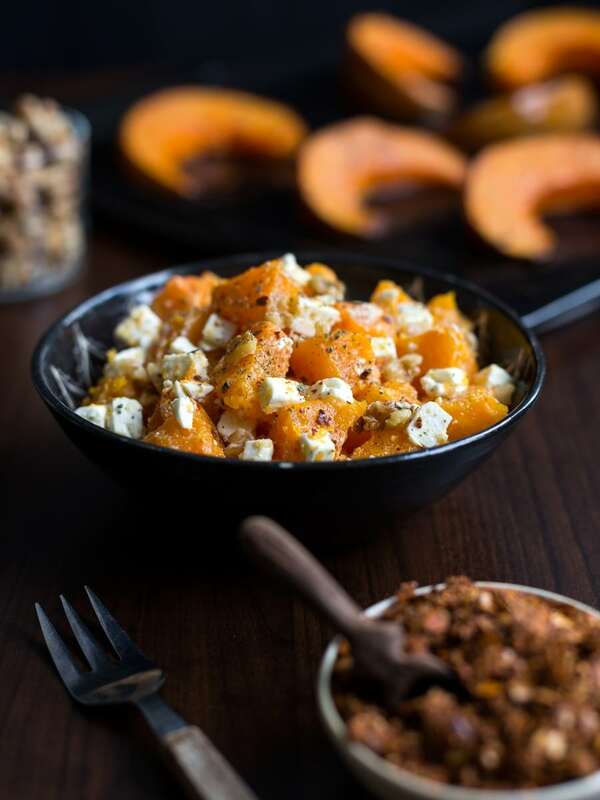 Pumpkin and feta is such an interesting combo, it sounds delicious! I can’t wait to try this salad! I’ve literally never even heard of muscat squash! But add feta to anything and I am sold. I love the addition of rosemary! 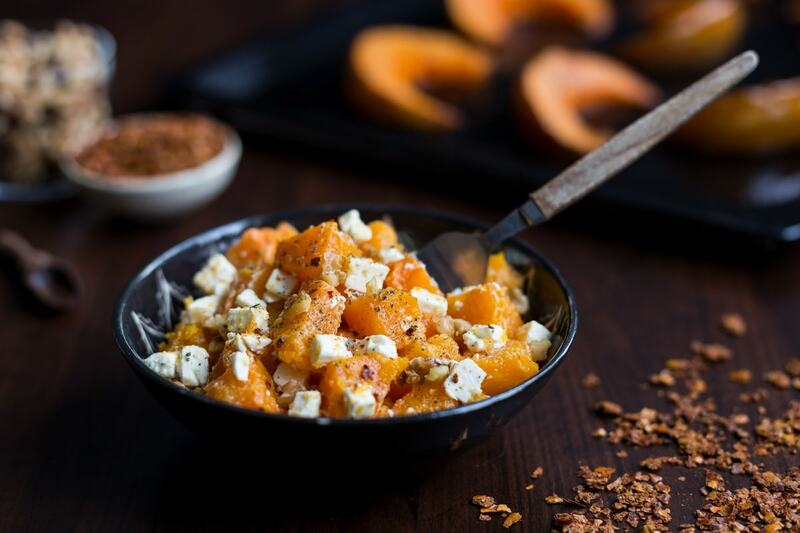 Pumpkin and feta, oh that sounds heavenly delicious. This salad is something I will definitely try soon. I love how that roasted pumpkin looks. Super easy recipe to make too. Love it!